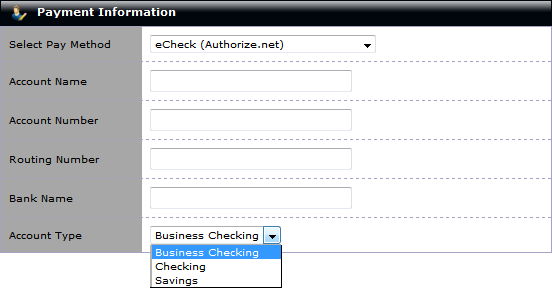 An eCheck (electronic check) is an electronic version of a paper check, used to make payments online. Some payment gateways offer this as a payment method you can provide through them in addition to their regular merchant services. Payment in the form of an eCheck will debit the customer's bank account, and requires the customer's routing number, bank name, account number, etc. Can currently only be used as a form of payment using the Place an Order Tool and in the Subscription Editor. Electronic checks are not yet compatible as a form of payment in the public storefront. Need a payment gateway? Enjoy our low rate of 2.09% through Authorize.net!